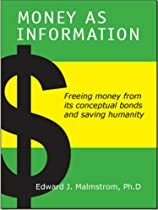 The author proposes a conceptually simple but earthshaking change to the way we think about money. The way we view and use money has changed very little for many centuries, but our present world is much more complex. We know far more than ever about how we, our world and the universe function, yet we seem unable to solve our perennial problems of poverty, crime, homelessness and war. Most of their solutions involve money, but the world never has enough money to tackle them effectively. If the author’s proposals were adopted, these problems could be eliminated or greatly reduced. To do so, we must think outside the economic box that imprisons us.